Sean Burke still can't bring himself to watch the game. The general manager of Canada's men's hockey team at the Pyeongchang Olympics has no interest in reliving the country's stunning 4-3 loss to Germany in the semifinals — a defeat that cost the group of non-NHLers a chance to play for gold. Sean Burke still can't bring himself to watch the game. Canada's Olympic men's hockey team — where are they now? 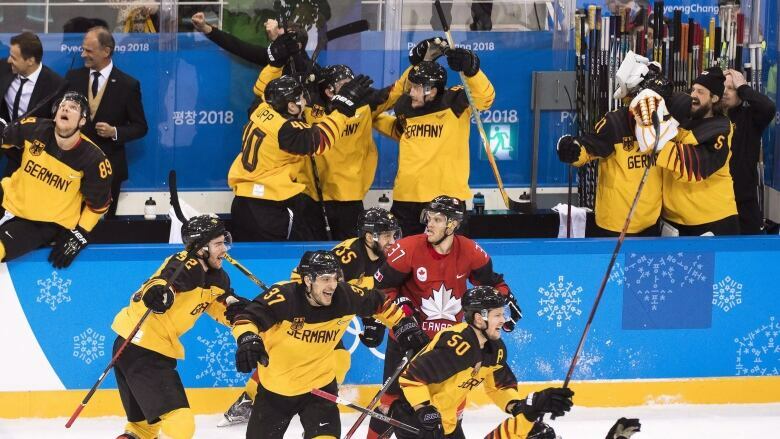 The general manager of Canada's men's hockey team at the Pyeongchang Olympics has no interest in reliving the country's stunning 4-3 loss to Germany in the semifinals — a defeat that cost the group of non-NHLers a chance to play for gold. "It hurts sometimes to think about," Burke said. "We played our best hockey all but one period against the Germans. "I feel bad for the guys. It's too bad that one period ... you don't get a chance to redo it." The men's event at the 2018 Winter Olympics got underway a year ago this week, and while Canada would recover in time to win bronze just 24 hours after the shock defeat to Germany, that result in the semis to one of the game's minnows still stings. "I don't know if I'll ever have such a tough situation in hockey again," defenceman Maxim Noreau said in a recent phone interview. "That was probably some of the toughest minutes I've ever had in my life — just looking around that locker room and seeing tears in everyone's eyes." "You have to come up with your best game at the right time," added Burke, also a scout with the Montreal Canadiens. "Unfortunately if you don't, you don't have a seven-game series. It's quite an intense event. "It brings out the best, but it can also show your cracks." The 2018 Olympics were the first not to feature NHL players since 1994 after the league declined to send its stars to South Korea. The move left many hockey fans disappointed, but the group of pros selected from leagues scattered around the world to represent Canada ran with the once-in-a-lifetime opportunity to wear red and white on sport's biggest stage. "We're objective and we know people want to see the best players," said the 31-year-old Noreau, a Montreal native and member of Zurich SC in Switzerland. "But we wanted to make sure we proved that even though we were in Russia or Europe that we're still good players. "Everyone had a little bit to prove." Fellow blueliner Cody Goloubef said it was great to see the group mesh in a short time. "It was an unbelievable experience getting to know guys going about their careers in different ways," said the 29-year-old from Oakville, Ont., who plays for the AHL's Belleville Senators. "We came together so quickly." Canadian head coach Willie Desjardins, who had a couple of pre-Olympic tournaments to figure out his roster with Burke and the management team, said there was tremendous anticipation as the clock ticked towards the Games. "I have a couple passions — one's hockey, the other's my country," said Desjardins, now the interim bench boss of the Los Angeles Kings. "Whenever you can combine the two it's pretty incredible. There were lots of unknowns going into it, but lots of excitement. "We were all excited about the chance." The Canadians then beat Finland 1-0 in a hard-fought quarter-final and expected to take on Sweden in the semis before the Germans, who had already ditched the Swiss in the playoff round, picked up their second of three shock results with a 4-3 overtime victory. "One of the mistakes I take a little responsibility for is that we never played the Germans before the Olympics," Burke said. "They were the only team through the whole process — 18 months — that we never played. "We had no book on them. Our guys just came out and tried to feel their way into the game. The Germans were coming off the high of beating the Swedes. They took it to us early." Canada fell behind 1-0 with about five minutes left in the first period before the wheels fell off in a second that ended with Germany up 4-1. The Canadians would rally to get back to within 4-3 — the Germans' only effort on target over the final 20 minutes was on an unsuccessful penalty shot — but they eventually ran out of time. "I've probably never seen a more down locker room in my life," said 28-year-old defenceman and Vancouver product Stefan Elliott, who also plays in Belleville. But unlike Canadian teams at other major tournaments where it's often gold or nothing, the players managed to beat the Czechs 6-4 in the third-place game and bring home bronze. "I learned a lot about myself and about other guys with how to handle adversity," Noreau said. "We were able to regroup. "We wanted to be part of something special and we're proud of what we've done."